Set your sights high on a world-class cruise vacation with Vision of the Seas! An amazing vacation is in sight aboard Vision of the Seas. Royal Caribbean has mastered immaculate service, and whether you're triumphantly enjoying the panoramic view from the rock climbing wall, trying your luck at the casino, or clapping your hands at a live performance, your entire family will love the countless onboard activities. With so many places to unwind, such as the fitness center, spa, and entertainment areas, traveling is anything but stressful on Vision of the Seas. If your inner foodie wants sophisticated fare or you just want something casual, you'll find a plethora of dining options, from sushi to classic Italian favorites. 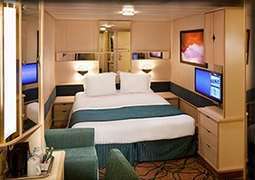 When you're ready to sleep, the ship's staterooms are your home away from home, complete with exceptional service and plenty of space. With Vision of the Seas, you'll take your vacation one notch higher and have an incredible experience. 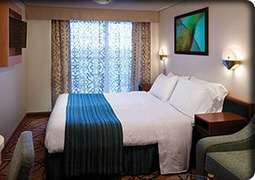 To make your stay more relaxing, 24-hour room service and a daily attendant come with every stateroom class. 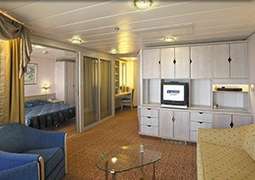 Even with a standard interior stateroom, you'll enjoy 132 to 164 square feet of space, including a vanity area. 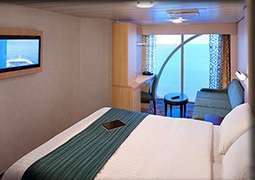 The large oceanview staterooms cover 151 square feet, and the balcony option provides an intimate view of the ocean. You'll surely feel regal in any of the five types of multiroom suites, which range from 243 to 1,176 square feet, including a living area. Dine like royalty at Chef's Table and dig into a five-course, private gourmet feast that's complete with wine pairings. For delicious Italian fare, Giovanni's Table serves classics with spectacular al fresco seating. At Izumi, indulge in sumptuous Japanese à la carte staples. For something more casual, Park Café offers typical foods you'll find in Central Park: salads, paninis, sandwiches, and more. Need a break from the kids? The solarium is an adult retreat with whirlpools, swimming pools, and a lounge to decompress. If your family wants a great view of the ocean, climb to the top of the rock climbing wall and marvel at the view beneath you. Get the pampering you need at the Vitality Spa and Fitness Center, where you're only one massage or workout away from bliss. Spend a night mesmerized by a live show at Broadway Rhythm &Rhyme, or test Lady Luck at the casino. Whereas swimwear should be reserved for pool and water areas, casual clothing is allowed. While shorts can be worn during breakfast and lunch, certain dinner venues require smart casual clothing. Formal clothing, such as suits, ties, cocktail dresses, and evening gowns, is required for formal nights.